Just arrived in the mail from the publisher. This image was taken on a particularly cold winter’s night on the flanks of Mount Ruapehu – apparently the coldest of the year. As conditions were so clear I spent most of the night working on this image. At 35+ minutes per photo (plus similar time for the noise reducing dark photo phase) you don’t get too many photos for your labours, but this one came out a cracker, and I’m proud of the quality of the final results. Thanks guys. Tech details for those interested: Canon 1Ds Mark 3 with 16-35mm f/2.8L Canon lens. Exposure was 36 minutes at F/6.7,ISO 200. Use your compass to find the south pole and this will line up the centre of rotation of the star trails. This centre of rotation varies in height through the seasons. Tent was lit for a short period with a small gas lantern – too long and the colour of the tent would burn out to white (remember to ventilate your tent when using these inside as carbon monoxide can build up). See other images taken that trip some night shots, panoramas, Ruapehu summit winter. Please leave us your comments at the bottom, it’s great to hear from you. (plus similar time for the noise reducing dark photo phase)? Some digital cameras run a process that compares a long exposure you’ve taken to an equivalent exposure with the shutter closed (a black frame). This ‘outs’ any pixels not behaving as they should (hot pixels etc), that the camera can then ‘remove’ from the photo. It often greatly improves the image, but if you take a 30min exposure, you’ll have to wait for the camera to take a second 30 minute frame. That’d be the difference between and pro-sumer and a pro DSLR then. I did a bit of surfing and I think you can get some image processing software to do the same. It certainly seems to make a real difference. My last efforts were really noisy. 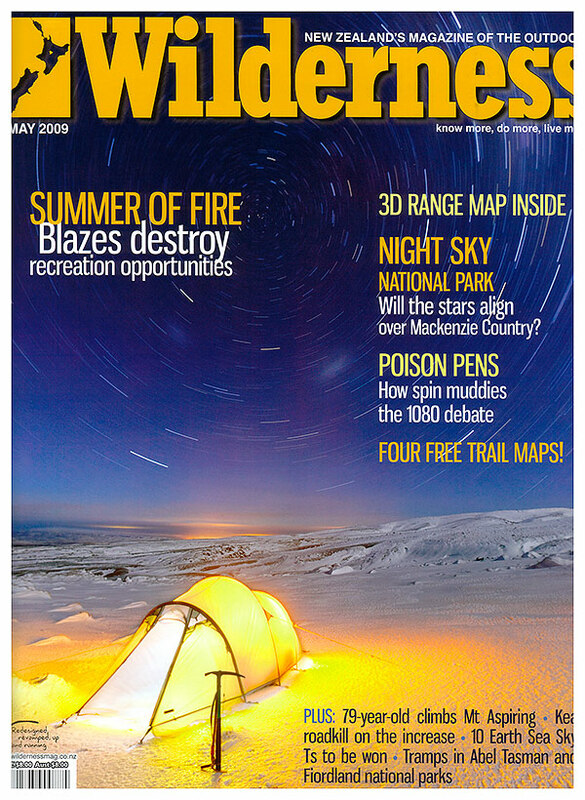 You're reading Wilderness Magazine cover by Rob this month… at Nature’s Pic Images Blog.